WASHINGTON, DC – Global Financial Integrity (GFI) released its annual analysis of the cost of crime, corruption, and trade mispricing on developing countries today. 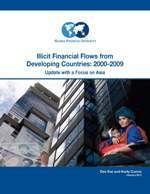 The report, “Illicit Financial Flows from Developing Countries: 2000-2009,” finds that approximately US$6.5 trillion was removed from the developing world from 2000 through 2008. The report also examines illicit flows from Asia, which produced the largest portion of total outflows, and makes projections for 2009. (Full report 3.35 MB, Tip Sheet 172KB). The report ranks countries according to magnitude of outflows with China ranking 1 ($2.18 trillion), Russia 2 ($427 billion), Mexico 3 ($416 billion), Saudi Arabia 4 ($302 billion), and Malaysia 5 ($291 billion). The report also shows the annual outflows for each country and breaks outflows down into two categories of drivers: trade mispricing and “other,” which includes kickbacks, bribes, embezzlement, and other forms of official corruption. “Every year developing countries are losing ten times the amount of Official Development Assistance (ODA) remitted for poverty alleviation and economic development,” said GFI director Raymond Baker. “This report measures the quantity and pattern of these harmful outflows and provides stark proof of the impact of these illicit financial practices." The report also looks at the impact of the global economic recession—on both magnitudes and trends in illicit outflows, it makes policy recommendations, and it projects outflows for 2009 (for which complete data is not yet available). To schedule an interview with GFI spokespersons on this report contact Monique Perry Danziger at +1 202 904 3113. On camera spokespersons are available in Washington, D.C. and—on Monday and Tuesday only—in New York. Click here for more on the report. Click here to see this press release on GFI's website.